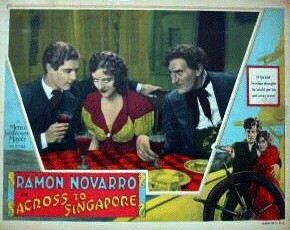 Cast: Ramon Novarro, Joan Crawford (as "Priscilla Crowninshield"), Ernest Torrence, Frank Currier, Dan Wolheim, Duke Martin, Edward Connelly, James Mason, Anna May Wong. Credits: Based on the 1919 novel All the Brothers Were Valiant by Ben Ames Williams. Continuity: E. Richard Schayer. Director: William Nigh. Camera: John Seitz. Editor: Ben Lewis. 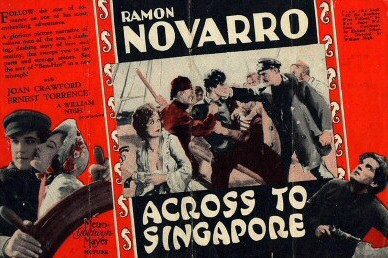 Don't try to follow the intricacies of this plot--just keep in mind that the turmoil of villainy and the sea will not overcome either Ramon Novarro or Joan Crawford. Ernest Torrence, as a horny-fisted old salt, dismisses formality and announces his engagement to the girl without consulting her. Crafty Chinese complicate matters with mutiny, dope dens and attempted seduction. Recommended as a stimulant. 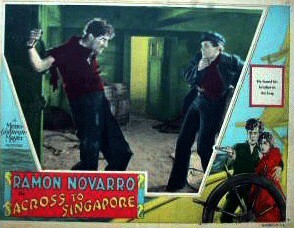 Ramon Novarro miscast as tough sea dog. Should have played him up on the Romeo stuff. Joan Crawford petite and always an alluring picture. Ernest Torrence dominates in strong characterization. Although "Across to Singapore," the present film offering at the Capitol Theatre, has some expertly composed scenes and genuinely clever acting, the story as a whole is frequently artificial and forced and therefore unconvincing. It is a yarn of a mariner's unrequited love and valiant efforts have been made to give it a sea-worthy quality. The title-writer diligently puts into the mouths of the male element his conception of the lingo of the sea, which smacks more often than not of musical comedy. The shallow attempts at fun are often quite feeble and hardly the sort of thing one hopes for in a serious dramatic subject. "There's a mad sea and a crazy gale challenging us Shores to fight." "The sea's hungry, she'd rather have two than one." On the other hand there is a scene in a barroom during which both Mr. Torrence and Ramon on Novarro are decidedly competent. But even here the idea of Joel (Mr. Novarro) flipping stones with unerring aim at Mark and a foreign sailor is rather silly. It is also quite stupid when Joel picks up an unconscious man and proceeds to pretend to fight and lay out his victim. Joel is supposed to be lacking in nerve and strength required for the sea, but this youngster endeavors to prove to his older brothers that he is as good as they are. He is superior to them when it comes to winning the affection of the beautiful Priscilla. 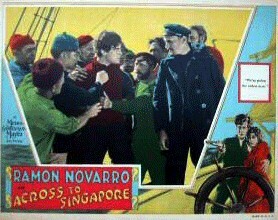 It is in Singapore that Mark goes to the bad and his ship has to sail without him. 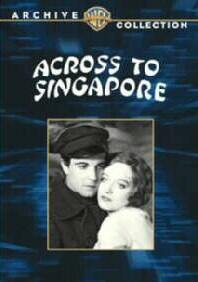 Eventually after the return to Paradise Cove, Priscilla decides to go to Singapore to prevail upon Mark to sober up and return home. The Nathan Ross, as the good ship is named, seems to be ready to go out to the Far East at an hour's notice. 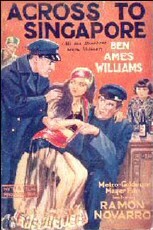 William Nigh directed this picture from an adaptation of a story by Ben Ames Williams. He does not always give his characters credit for sufficient intelligence and in the announcing of a betrothal one would think that the man in the case would have mentioned something about it to the girl he hoped to marry. At the end of the church service at which this announcement is made, one perceives Joel standing in the aisle, but apparently he does not attract the attention of a soul. Ernest Torrence is splendid as Mark. 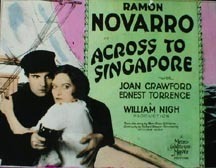 Mr. Novarro's performance is also quite good. Joan Crawford, who plays Priscilla, is best in those moments when she is natural and is not thinking about turning her eyes for effect. It was among the first feature films to star a very young Joan Crawford, and it was almost lost in the period when Hollywood made the transition from silent films to soundtracks in the late 1920s. 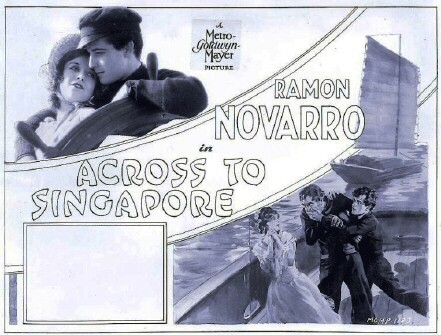 But a single 35mm print of 'Across to Singapore' (1928) survived, allowing this timeless and ambitious tale of the sea to be rescued and enjoyed by today's moviegoers. Set in the 1800s during the era when wind-powered sailing ships still ruled the seas, 'Across to Singapore' tells the story of two sea-faring brothers whose long-standing love and respect for each other unravels over a woman. 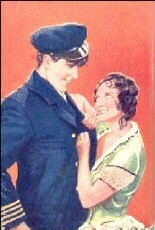 Burly older brother Mark (played by Ernest Torrence), a tough sea captain, is unexpectedly betrothed to Priscilla Crowninshield (Crawford) during a brief visit to home port. 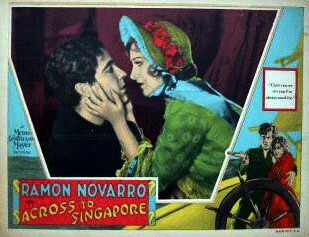 But since childhood, Priscilla has had feelings for Mark's younger brother Joel (Ramon Novarro), now preparing to ship out with Mark on his first adventure. Can Priscilla's love for Joel survive her forced marriage to his domineering older brother? When the brothers set sail for Singapore, a gale stirs up the situation into a full-blown crisis that leads to mutiny, kidnapping, and a murder plot. Can the brothers overcome their bitter mistrust of each other, survive the storm, save the family shipping business, and do the right thing for the one woman that haunts both of their lives? 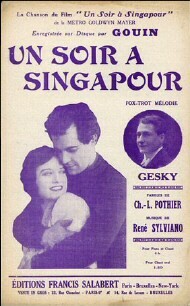 'Across to Singapore' (1928), directed by William Nigh, was among the last silent dramas produced by MGM, then the most prestigious studio in Hollywood. 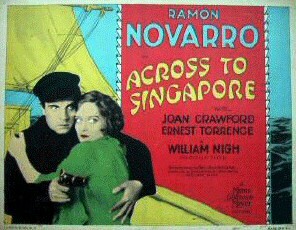 In addition to up-and-coming female star Joan Crawford, the film starred A-list actor Ramon Novarro, a heartthrob at the peak of his popularity, as well as gruff character actor Ernest Torrence. 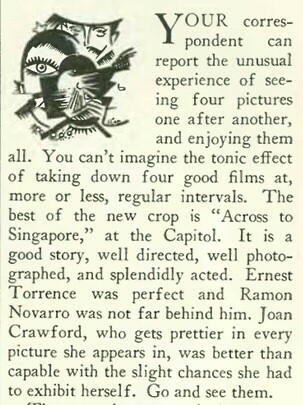 However, like many late silent film releases, 'Across to Singapore' was not carefully preserved following its initial release as MGM rushed to convert to making talking pictures. The film's original negative was lost, and other materials fell victim to neglect and decomposition. 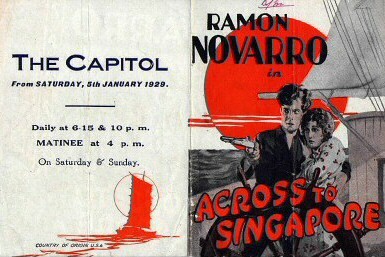 In later years, only a single 35mm print of 'Across to Singapore' was known to survive, and had begun to partially decompose before it was copied. Although some sequences remain marred by decomposition, the film is largely intact. 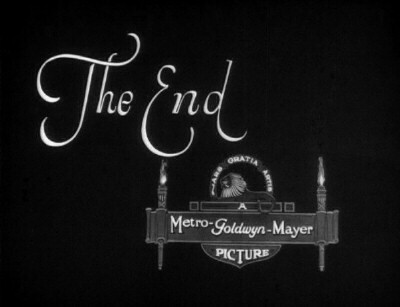 It stands as an excellent example of silent film story-telling at its peak, just before the form was abandoned. If you've seen Across to Singapore and would like to share your review here, please e-mail me. Include, if you like, a picture of yourself to accompany your review, as well as a star-rating (with 5 stars the best) and any of your favorite lines from the film. Just three films away from making her big splash in the ultra-modern Our Dancing Daughters, also released in 1928, Joan here plays an 1800s lass caught in the middle of some weird psychological drama between two seafaring brothers. As "Priscilla Crowninshield," Joan gets to glow, grin, weep, and shoot a guy down from a top-mast, and she accomplishes every sometimes ludicrous task with a professional ease that shows she was up for anything the studio handed her. Plot complications arise when Joel's oldest brother Mark (the rough-hewn, towering Ernest Torrence) decides he loves Priscilla and their fathers promptly announce in church, without Joel or Priscilla's knowledge, that Mark and Priscilla will be wed after the brothers return from their upcoming voyage to Singapore. Joel and Priscilla's exchanged looks of dismay during the announcement are subtly expressive, as is their farewell scene aboard ship the next day, where Priscilla sensually nuzzles the now-reluctant Joel, who feels compelled to remain loyal to his brother. So far so good in this first third of the film. After this, however, things seem to go a little awry. Brother Mark has noted Priscilla's shipboard reluctance to kiss him goodbye and he soon begins to brood over her (even hallucinating her ghostly presence in a ship doorway. Later, funnily, her face even pops up in the bottom of his glass!). Once the brothers dock in Singapore, Mark starts boozing it up in a brothel, to the shock of the innocent Joel: "You've got to remember Priscilla!" Joel chides, pulling a harlot from Mark's lap. Mark quite rightly orders Joel back to the ship, then stumbles into the night with his newfound Asian floozie, only to get jumped by a combination of local toughs and mutinous sailors from his own ship. He disappears and is assumed dead by all except Joel. His ship sails for home without him. Did I say things seemed to go "a little awry" earlier? Well, at this point the plot ventures beyond "awry" into the "haywire" territory. 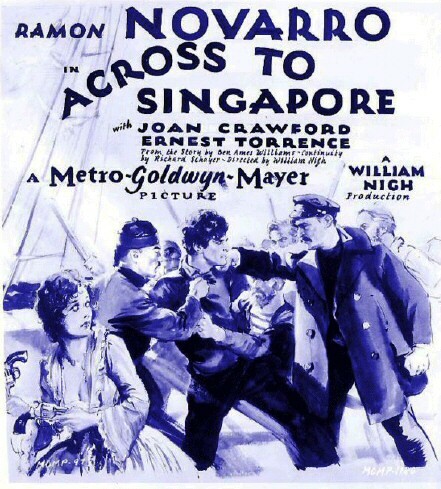 In short: Once back home, Joel, who's suddenly evolved into a stubble-bearded tough guy himself, now kidnaps Priscilla and forces her to sail back to Singapore with him and the once-mutinous crew. Since she has driven his brother mad, only she can rescue him. Cut to a hilarious title: "Six months in Singapore has made Mark a drink-crazed, half-mad, gibbering derelict." Sure enough, there he is, drinking and gibbering, driving his now live-in Asian floozie mad with his incessant sea chanties. The derelict Mark somehow, though, manages to spot his ship in the harbor and is reunited with brother, Priscilla, et al. 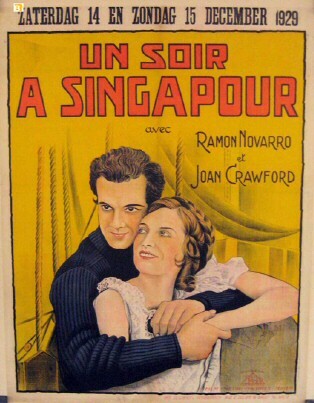 In spite of the haphazard latter part of the film, Across to Singapore is partially redeemed by the first third, where Joan and Novarro get to be their charming, attractive selves. It's a pleasure just being able to watch the two of them, despite the ensuing bizarre plot convolutions.